The Port of Hamburg handled total throughput of 35.6mt (million tonnes), up by 0.1%, in the first quarter of 2015. Bulk cargoes at 11.7mt (up by 12.3%) and container transport on railways between the port and its hinterland at 602,000 TEU (up by 11.1%) were the strongest contributors to throughput growth. “We can be satisfied overall with the first-quarter trend in seaborne cargo throughput. Even if a slight 4.9% downturn in general cargo throughput at 23.9mt slightly dampens our satisfaction, this remains the best-ever first quarter in the port’s history,” stressed Port of Hamburg Marketing’s Executive Board Member Axel Mattern at the marketing association’s quarterly press conference. Throughput of bulk cargoes was up in all the three segments, for suction cargoes by 19.4% at 2.7mt, grab cargoes by 17.2% at 5.5mt and liquid cargoes by 1.3% at 3.5mt. The trend was especially notable on coal imports that at 1.8mt increased by 64.1%. On the export side, the main contribution to this excellent result came from wheat, where volume handled rose by 44.0% to 1.62mt. Container throughput for the first three months of the year at 2.3 million TEU (20-ft standard containers) remained below the previous year’s strong result, which had been unusually satisfactory, representing an advance of no less than 8.0%. There was a slight, 2.3% downturn here. This was primarily attributable to a fall in container traffic with Russia. In the first quarter a total of 109,000 TEU were transported between Hamburg and Russian ports on the Baltic. That represented a 34.8% fall by comparison with the same quarter of the previous year. In Mattern’s view, it may be assumed that should sanctions be lifted and a recovery occur in the Russian economy, seaborne foreign trade via Hamburg will climb once again. His Executive Board colleague Ingo Egloff pointed out that the Port of Hamburg is the leading hub in Northern Europe for container services with the Baltic region and that Port of Hamburg Marketing is devoting increased attention to Baltic markets. The recent accession of the ports of Gothenburg and Bronka to the marketing association also underlines its excellent links with the region. 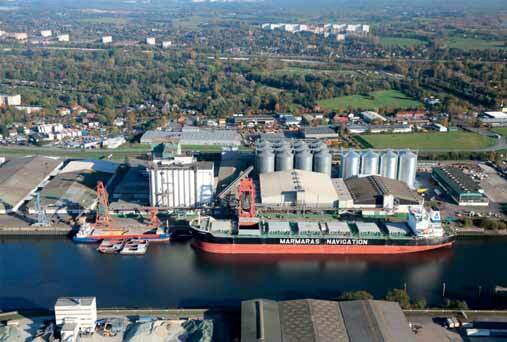 transport schemes, bottlenecks should be avoided in the Port of Hamburg’s incoming and outgoing traffic. This can be achieved, for example, by greater utilization of rail for seaport-hinterland transport,” explained Egloff. In the first three months of 2015 cargoes totalling 11.4mt, or an increase of 8.3%, were transported on the Hamburg Port Railway network. At 602,000 TEU, container transport by rail grew by no less than 11.1%. In future, even more efficient use will be made of the port’s rail infrastructure. Neutral, overriding control, or ‘Rail Operations Management’, will take over co-ordination of rail services and further optimize operating processes. Together, terminal operators, the port administration and German rail network — DB Netze — aim to continually increase the quality and efficiency of the Port of Hamburg as a supply chain element. “Along with the other North German states, in Berlin we shall be urging that seaport-hinterland traffic routes should be properly catered for in the new Federal Transport Infrastructure Plan. Only a high-performing and intact infrastructure will guarantee incoming and outgoing access for seaports in the interests of the entire national economy. We are also therefore hoping for a positive decision this year by the Federal Administrative Court in Leipzig on the implementation of the dredging of the navigation channel on the Lower and Outer Elbe,” emphasized Egloff. Both the dredging of the channel plus the expansion and modernization of transport infrastructure are of great importance for Hamburg’s future development as Germany’s leading port and logistics centre. Efficient transport links constitute the essential arteries for global foreign trade.The intelligent interchange and utilization of transport and logistics data, launched in Hamburg with smartPORT, will simplify efficient control of multimodal transport chains. Improved utilization of the existing transport infrastructure will as a result permit the acceptance and transport of additional cargo volumes.